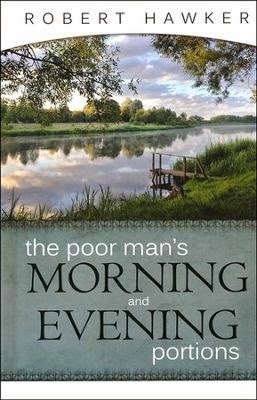 "The Poor Man's Morning & Evening Portions" by Robert Hawker is an extremely well written and well done devotional. Dr. Hawker was a solid and robustly evangelical preacher and teacher. This devotional is taken largely from his 8th volume of "The Works of Rev. Robert Hawker, D.D. published in 1831. I picked a printed copy and I am thoroughly enjoying this devotional book. Very few devotionals have such spiritual explanations and applications in one paragraph, and Dr. Hawker's work doesn't disappoint. It is loaded with edifying thoughts that aid in setting one's affection on things above! It is called the poor man's portions because Dr. Hawker made these comments and entries accessible to the poor originally published in "penny" portions so that the unfortunate can afford them, then after he died they collected his complete works into 10 volumes. This devotional is the 8th volume of Dr. Hawkers works. Hard Cover, 4th printing in 2011, 927 pages of great reading, scripture index in the back. Published by Reformation Heritage Books. There is a Kindle edition to this book, just search it out. Here is a link to a free PDF version.